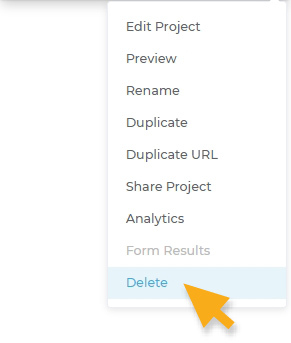 You can easily delete a project from your Dashboard area. Locate the project you want to permanently delete. Click on the hamburger icon located on the bottom right of the selected project. Scroll down and click Delete. It will prompt you to a new pop up screen to confirm that you want to permanently remove the project from your account. If so, click Yes. Delete a project only if you want to permanently remove it from your account. Once a project is deleted from your Visme account, it will be moved to Trash folder and remain there for 30 days. Once deleted from Trash, it will be permanently deleted from your account. Note: Within the 30 days from the date that you delete your project, you are still be able to have your permanently deleted project back into your Visme account. You can go to Trash folder, click the Menu option and select Put Back. If you published a project, it will no longer be accessible by public or users you gave access to.